He's a boss in the Servant's Quarter of Karazhan. To have this boss appear, you must kill all the adds in the Servant's Quarter. My group had to kill respawns. He is in a nook ( stealthed) in where the spiders spawn near the campfire. Tank and spank fight, "Stun"/Web is dispellable. After killing all the trash you know you're done when you see the emote "Hyakiss the Lurker skitters out from the shadows..." if you have Hyakiss. Tank and spank. I equate the difficulty of this boss to logging into the game. this is strange cause first time we did have respawns but still bat boss came... how's that ? Please note that Hyakiss is stealthed when he spawns. Flare does not work for detecting him. He is in the left side of the room with the two ramps that lead to the bats as you go in from the main entrance. Have your warrior go in there and lure him out. Make sure you are dispelling poisons, they hurt. guys I have such question - THIS BOSS RIALY CAN BE TAMEAD? Has anyone found out yet if these 3 bosses drop the Badge of Justice that the other bosses in Kara now do? If so, this would be a good solid run for new kara people to get used to the zone as well as get some drops/badges. This spider is listed as tamable here. However, according to Petopia, it's not. It seems that the skill Acidic Wound listed here is actually the BT version? Like most Karazhan Bosses he is soloable by a DK. But dont underestimate him, he CAN beat the f*ck out of you if you're unlucky. When his poison stacks to much, you're dead. If he stuns you to often, you're dead. Time your cooldown, keep your health at 90% at all times, Death Strike whenever you can and he is no problem. Like DerSenf said, if you're not careful, this dude will beat the ^&*! out of you... I only took him down because Forbearance wore off right before I was about to die and I DS'd out of his 15second-and-continuing web stunlock. I pulled the last few bats and hounds together. As soon as the last bat died, I go the message "Shadikith the &*! @#$ flaps down from the ceiling..." I was still fighting hounds, so it is not always necessary to clear all of the trash. I pulled the last few bats and hounds together. As soon as the last bat died, I go the message "Shadikith the *! @#$% flaps down from the ceiling..." I was still fighting hounds, so it is not always necessary to clear all of the trash. Edit: On my next clear, Rokad spawned while I was finishing off the hounds. Loved the Spider Room. I got a ton of spider silk for the imbued netherweave bags, which sell for Silly High Money on my server, considering they are only 18 slots. Just soloed on 80 rogue in nothing special gear.... Super Easy.... Just time your recuperate with her webbing and its a easy 2.5 minute job. Don't have screen, but if you look up the Maiden from this instance.... you see I soloed her too in the same gear. 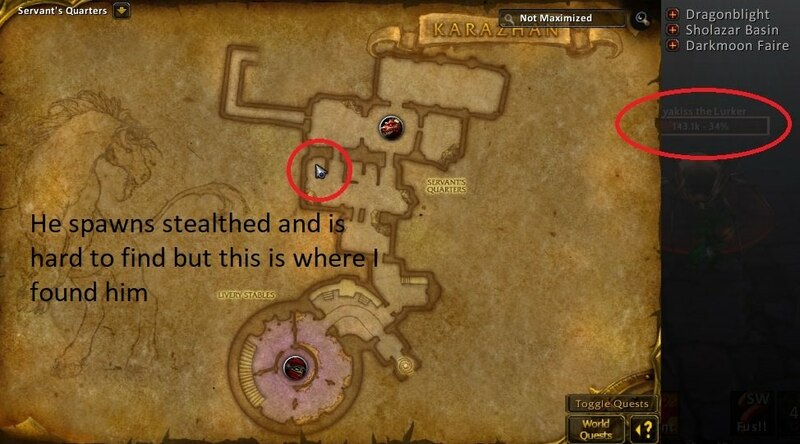 You can farm the rares of Karazhan by simply going into the instance, clearing the basement trash as always to spawn the either, Hyakiss the Lurker, Rokad the Ravager, or Shadikith the g-l-i-d-e-r. This was known, but what I just discovered is that if you ONLY clear the basement and DO NOT do anything else you can leave, reset all instance, go in and clear again and get another rare! Just did it and it worked! The drop nice Epic's for 70s and transmog gear too. Happy farming! As has been previously mentioned, the Servant Quarters bosses - Rokad the Ravager, Shadikith the @#$%^&, and Hyakiss the Lurker are indeed pushovers. If you like me are farming this for the T3 Paladin Transmog Set (Looks excactly like the redemption girlde) I've got a tip. If Hyakiss the Lurker dosen't spawn after you have killed the adds you can just run out and reset the instance, kill the adds again and do this untill Hyakiss spawns. If he dosent drop the plate belt you can just repeat (run out, reset, kill adds, kill Hyakiss) untill it drops so you dont have to wait for the weekly reset. I've been farming him today for the paladin T3 lookalike belt, and I can confirm that the rare spawn is random; if you get the same mob over and over, it's just bad RNG, unfortunately. He will not spawn until you completely clear the servant's quarters. You'll get a chat message when he spawns: "Hyakiss the Lurker skitters out from the shadows..."